A few weeks ago Pierce and I went to test drive some used cars (for the second time), with the idea that I was ready to buy one. My minivan, which had tormented me with breakdowns since I bought it used in 2009, was on the last leg. It's a shame - I loved the way it drove and all the space but talk about a lemon! I hate car shopping. Most people get excited about it. I obsess about the financial aspects of such a big purchase, and hate the tediousness of it. It seems like someone is always trying to make an extra dime and this leads to shady behavior and paperwork, and then I have to get mad and threaten to walk out so they will fix it. A shame that companies do this to people. I wish someone could just tell me the right vehicle for me to get, tell me it is a good deal, and hand me the line to sign on. "Mom, now that you found a car, are you going to hit the bong?" What he meant was the GONG. I let Pierce hit the gong for me. I laughed so hard all four dogs came running up to find out what was going on! Sounds like how they do my wife when she shops for cars. Some of those guys would probably whip a bong out of their desk if it would sell a car. Ha ha, too funny. Reminds me of Art Linkletter's old show segment: "Kids say the darndest things". Later Bill Cosby did that show. I have used the same salesman for years. I call and ask what he recommends and go look.It helps to have a good insider. Girl, I am soooo with you! Car shopping is the worst! It's exciting to think about getting a new vehicle.... until, like you said, you think about the financial side of it and you start dealing with car salesmen or owners who are trying to rip you off. Your going to school comment has me in stitches :-). He looks happy hope you are too. I hope you got your car. I'm with you--I don't like the whole process of buying a car. We just bought a new model and the process seems to go faster now, but still....it's just so smarmy. At one point, my husband asked "Is this the part where we haggle?". Yeah, I guess we aren't good at it either. Oh my gosh, funny! Do you know that they sell bongs in a store here? So you got the car? Is it a van? Now I want to see it and all the details...how old, how many miles, did you drive it home? I totally agree. Car shopping would be fun if we were assured the salesmen were honest. We have even test driven a car straight to our mechanic! We had to sell our van to the junk place recently and I miss it so much. There is barely room for my purse in the Mazda. Oh my funniness!!!! Bong, gong? What's the difference? Oh....brain cells, that's the difference! Congrats on the new ride-I hope it works out better for you. But, DID you hit the "Bong-Gong?" Was it a satisfying sound? Did the young ones have a turn - did they SMILE beyond reason??? I hope you enjoy the new addition to the "fleet" of cars and horses you have for transportation. And, I hate car shopping, too! Congratulation for your new car. Actually, I don't like the sound of gong. I love that kid - he is wonderful - bong and all! LOL, I had no idea what I'd read or see when I opened this page! Too funny. I hope the new vehicle is awesome! I actually spit out a laugh on my computer. That was so funny! There isn't much I dislike more than used car shopping. Never a pleasant experience. Haha The things kids say! I feel the same exact way about car shopping. I loathe it because I feel like I'm getting jipped every time. Oh, how cute. Thanks for the laugh. YOUR DEAR CHILDREN, FAMILY, LOVED ONES! HAVE A BLESSED TIME WITH THOSE YOU LOVE, LISA! Too funny he said that! And congrats on your new car. However you celebrated, bong or gong, that's worth celebrating! Aw, I left a comment on Friday, but it apparently didn't go through. I did it on my phone; maybe that's the problem. 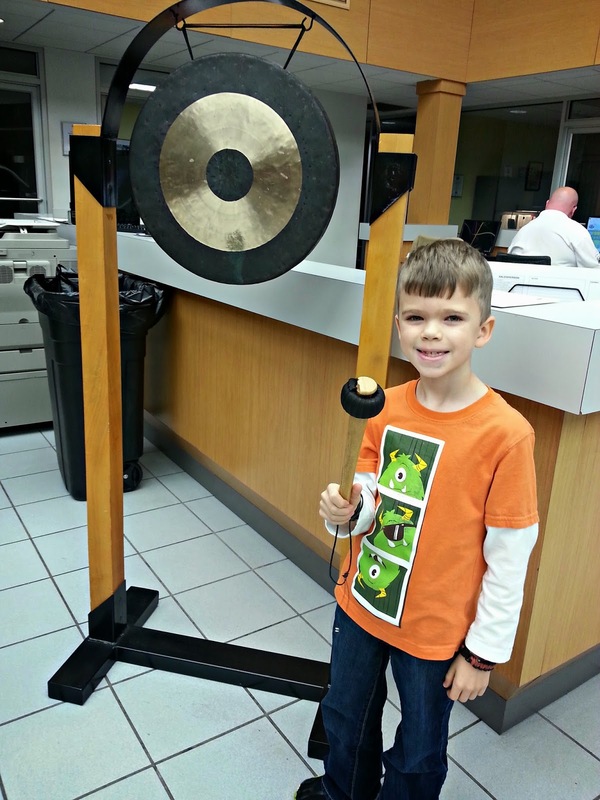 The funny thing is, is that my husband was commissioned to make a gong holder once. It's funny he said, "Bong" instead of "Gong".